The prevalence of IED's in Afghanistan is causing a high number of "life-changing" injuries to the lower body. These include blinding and blast injuries to the groin, which can result in a ruptured colon or loss of genitalia. For all soldiers such injuries are "life-changing". They are extremely difficult to live with psychologically. Within the periphery of a blast, perineal and femoral artery injuries can be fatal without immediate specialist medical help. A puncture to the femoral artery can bleed out rapidly leading to death. 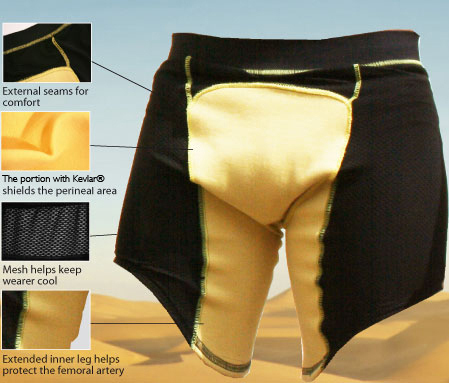 Following trials and ballistic tests, BCB have designed these Blast Boxers using a special comfortable Aramid fabric, positioned around crucial zones of the groin. Light open structure mesh is used on the rest of the garment to help offset the weight and thermal load of the ballistic material.